A hot air balloon which landed in trees in Melbourne’s north this morning was transporting three couples who got engaged while floating above the city. “There was too much emotion for one balloon,” joked Brendan O’Loughlin, who proposed to partner Emma Govan during the flight. The balloon got caught in trees while trying to land by the Karingal Yallock Creek in Eltham North, in Melbourne’s northern suburbs, just before 7:30am. The basket of the balloon hit the ground safely and no-one was injured, but Mr O’Loughlin said the trees “ripped a few holes in the balloon”. Five crews from the local CFA attended the incident in the Ramptons Road Reserve, using chainsaws to help untangle the balloon from the branches. Crews from the MFB and SES were also called to the scene. The balloon took off from Heatherton, in the city’s south-east, around dawn. Passengers said the pilot was battling windy conditions as he prepared for landing near the Yarra River and was blown off course. Nial Finegan witnessed part of the incident from another balloon in the convoy. “We landed OK on [one] side of the Yarra, whereas they drifted to the wrong side,” he said. Ms Govan — a school teacher who thought she was being taken for an early morning swim before her last day of classes — was full of praise for their pilot. “It was a pretty smooth landing,” she said. Far from being a near-death experience, Mr O’Loughlin said the landing was relatively smooth. “The take-off was scarier than the landing,” he said. Another passenger, Beatrice Imbert, said the landing was “unusually smooth”. “Just really like a soft touch,” she said. 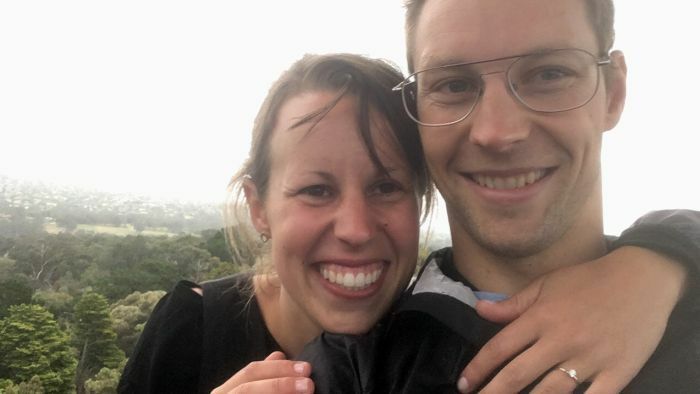 He was one of three people to propose to their partners during the dawn ride, though he said it was only once the balloon landed that they realised the other couples had also gotten engaged high above the city. “It must be a popular thing to do,” he said.